I've been waiting for five months to share this film, and I'm so glad that I finally get a chance to show off what I think is destined to be one of the best genre films out of India this year. Director Prasobh Vijayan makes his feature debut with Lilli, a Malayalam language revenge thriller from the southern state of Kerala and it's one of a slew of really solid genre features out of the region this year. Vijayan's first film is a nail-biter that not only has all of the traits of an impactful thriller, but also manages to seamlessly integrate a lot of the sociopolitical and cultural paranoia that has paralyzed much of India over the last several years. While the trailer does a good job selling the atmosphere, it is deliberately vague about what makes the film really special, but trust me, this is one you won't want to miss. Lilli comes to the screen courtesy of E4 Entertainment, who also released director Rajeev Ravi's debut feature, Anna and Rasool in 2012 and the Dybbuk horror film Ezra in 2017. Lilli stars Samyuktha Menon in the title role, with support from Kannan Nayar (co-lead of Sanal Sasidharan's S Durga), Dhanesh Anand, Sajin Cherukayil, Kevin Jose, and Aaryan Menon. The first teaser below starts off a bit slowly, but it soon picks up speed and gives you a good feel for what the film becomes. This is a case of a project that is definitely more than meets the eye. I had an opportunity to see a work-in-progress cut of the film and it instantly rocketed to the top of my must-see list for 2018. Current release plans are for July of this year in India, however, I hope that's not the only place it gets seen. Fingers crossed! 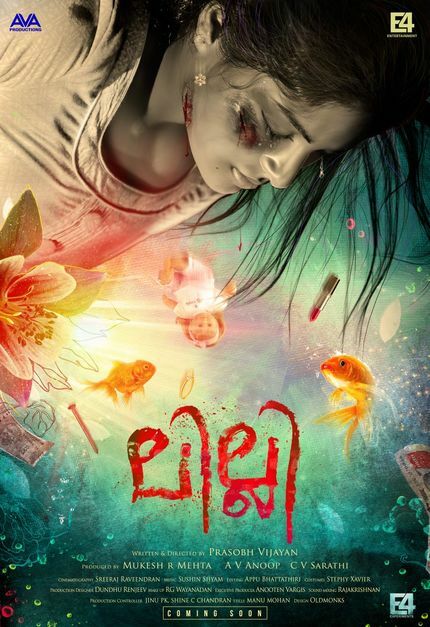 For now, check out the first teaser for Prasobh Vijayan's Lilli.